It has been a number of years since we have seen a faceted example of this peculiar variety of inclusion gem. 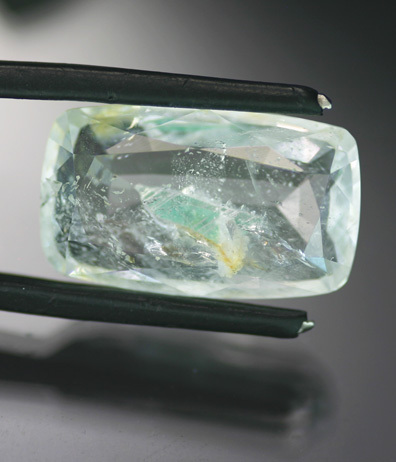 These are from the area immediately around Mogok and are quite striking - the colorless Topaz features a single jagged crystal of bright green Fluorite. The Fluorite's color is particularly nice - we have never seen it in inclusion specimens from any other locale. Furthermore, the wide and shallow cushion cut is simply charming - we have no idea how recently this stone was cut, yet it has the proportions and visual impression of an old stone. Fun and rare.